after i was done with my eyes i decided it would be fun to drop my Ulta makeup set..
most of the colors fell out of the box and now i dont know which colors go where.. which means i'll never know the names of them.. yyyyyy!? lol.. I thought about ordering that palette. I shall play with my palette today. haha I started to until my sister told me to tag along with her. I especially like the blue, pink, purple combo. 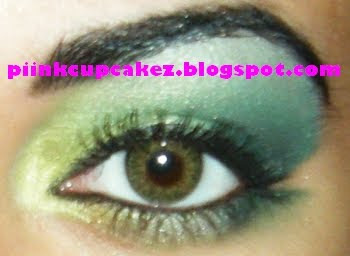 with green eye shadows your eyes looks GEORGEUS!!! but I like both of them !!! hooooooray for your use of color!! i love seeing fotd's with colors it gives me the itch to wanna play in my eye shadows. these are beautiful! im so jealous! i wish i could do my makeup like that!!! 2 great eyes? what a treat! thanks for following girl! priiiiiiiity! of course I mean pretty. but your eyes are so gorgeous I had to exaggerate! Your blending skills are seriously sick!! Love the looks babe. 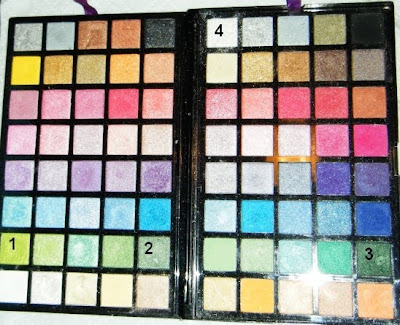 I'm totally wanting that palette...the colors are so vibrant. TY for sharing your amazing work!